Clearwater Beach Florida – If you are coming to the 2012 Republican National Convention or just will be in the area the next two weeks there’s one more thing to add to your list of fun and free things to do – visit the Clearwater Dolphin Exhibit at Clearwater Beach Pier 60. Jack and I went last weekend to beat the crowds and bring back some photos and video for you. 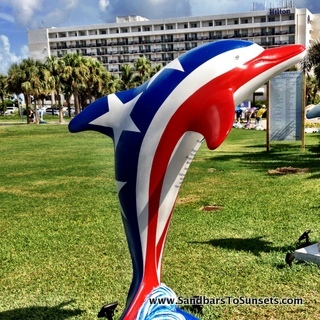 The Clearwater Beach Chamber and local businesses worked together to sponsor and create an amazing exhibit of art – 50 bottle note Dolphins line the sidewalk at Pier 60 – you will be greeted by these festive dolphins each with a personality all its own. I shot a quick video to give you a sneak peek at them however I would strongly encourage you to go see them for yourself – they will only be on exhibit at Pier 60 until Sept 4th. There are so many I really liked especially “Hope” from the Suncaost Hospice Foundation and the one painted by Winter the Dolphin – which Clearwater Dolphin is your favorite? Tell me us the comments below….